John handcrafts every piece of jewelry, all signed and numbered. He takes pride in the fact that his work is original, distinctive and matchless. 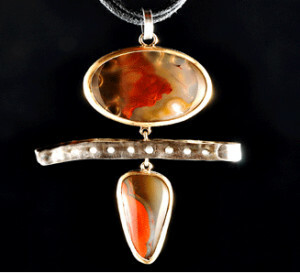 John creates jewelry to be eye-catching whether it is the color of the stones, shape of the designs or the markings acid etched in gold and silver: he wants to make it stand out above the rest. John's first technique is an acid etch process. 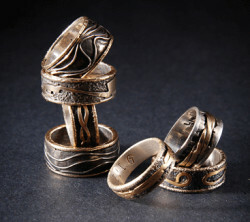 He uses fine silver or sterling silver for a base and builds up from the base using 14K, 18K and 22K gold. After he design is laid out; he floods the piece with acid, then soaks the piece in the acid and the copper is eaten out of the piece, thus creating the look that you see. The only reason he uses a silver back is to keep the cost down. (Solid piece gold back can drive the price up a few hundred dollars; however a gold back is available upon request.) All gems are authenticate: pearls, diamonds (colored diamonds, also), hand-cut Kentucky Agate and various other gems. 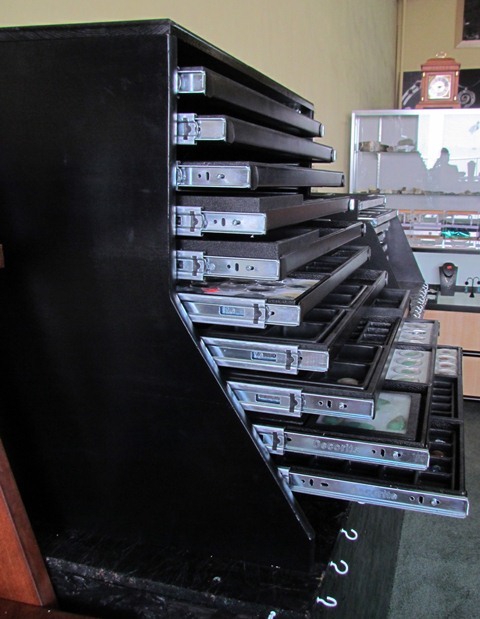 The customer can order selected stones, bring in stones or choose stones that John has in store. John does cut Kentucky Agate Cabochons in store. John incorporates these Kentucky Agate cabochons; he produces a distinctive, unique jewelry line which also cannot be reproduced. Taking stones that have brilliant color and distinguishing markings; John hand makes settings to display and emphasize the features of various brilliant stones. John will be doing several art shows around the region, come back and check out the places and dates. Now offering a storage system for vendors.